Above is a very powerful version of the song ‘The Contender’ by Paul McGrath. The song was made famous by Christy Moore, whose version is at the bottom of this post, and is about Jack Doyle who died on 13th December 1978. Popularly known as ”The Gorgeous Gael”, Jack (Joe) Doyle was born into a working class family on August 31, 1913, in Cobh, Cork. It was a tough town but Doyle learned early on how to look after himself. He was to become at one time or another a contender for the British Boxing Championship, a Hollywood actor and a popular tenor. 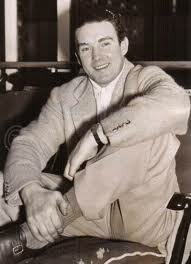 His father, Joe Doyle, wanted to be a professional boxer, but injury put an early end to his career. Instead he transferred his ambitions to his young son. Jack was said to be inspired by a book, How to Box, by World Heavyweight Champion Jack Dempsey. He joined the Irish Guards in Wales and at 6 foot 4, quickly excelled at boxing and was famed for his strong hooks that won him the British Army Championship. A remarkable record of 28 straight victories, 27 by knockout, brought him to the attention of promoter Dan Sullivan, who bought him out of the army. He turned pro and notched up ten victories on the trot, all inside two rounds. In July 1933, at the age of 19, he missed out on the British Heavyweight title to the holder, Welshman Jack Petersen, before 85,000 people in the White City in London. He had done most of his warming up in a pub not far from the venue and within the opening seconds, knowing he was in trouble, decided to take the easy way out. He was disqualified for repeatedly punching low. In his comeback fight, he knocked out Frank Borrington within 83 seconds. Shortly after, his singing voice was discovered by Dr. Vincent O’Brien, teacher to Count John McCormack. He was signed up by Decca Records and soon his tenor voice and handsome looks were selling out the London Palladium and the Royal in Dublin. He became a wealthy man by the standards of the day, reputedly earning the equivalent of £20,000 in some of his fights. But his love for the drink and generous nature soon started to take its toll on his pocket and his health. He travelled to America in 1934 and carried on his high living of gambling, ladies and drink. His good looks, bad-boy image and ability to attract Hollywood divas and American heiresses brought him close to people’s hearts. He acted in two movies, McGlusky The Sea Rover (1934) and Navy Spy (1937). While in the States he continued to box, taking on one Buddy Baer in August 1935. Like his fight against Jack Peterson, it is said that Doyle had consumed the best part of a bottle of brandy before the bell rang and was in no fit state to stand. He was knocked down in the first round. He returned to Ireland with this new girlfriend, the actress Movita Castaneda, having recently split from his wife, Judith Allan. Following a celebrity wedding in Dublin’ they toured both sides of the Irish Sea, selling out music halls and opera houses. Around this time Jack fought his last professional fight, against a journeyman called Chris Cole in front of 23,000 in Dublin’s Dalymount Park. Arriving late for the bout after a stop at The Clarence Hotel for refreshments, the inebriated Doyle went down in the first. Movita had enough and returned to Hollywood where she married Marlon Brando. Shortly after Doyle was jailed in Dublin for knocking out a Garda detective in a pub. He moved to England and his downward spiral into alcoholism and bankruptcy continued. In 1950 he tried a comeback as a wrestler but the magic was gone. He found his friends had vanished as fast as his money, spent in his own words on “slow horses and fast women”. He odd-jobbed for while but when he couldn’t afford the rent on his flat he took to sleeping at the homes of friends or in doorways. His only source of income during this time was a £25 allowance he received from Movita. He was living on the streets of London when he was found dead on a footpath in December,1978, from cirrhosis of the liver. His body lay unclaimed in a London hospital until a delegation from Cobh brought his remains home to be buried. In spite of his wasted talent he got a hero’s funeral in Cork. He is remembered by thousands of Irish people at home and abroad as the first modern celebrity. The TV documentary below, Jack Doyle: A Legend Lost, was made by RTE in 2007. A book accompanying the programme, Jack Doyle: The Gorgeous Gael, ISBN 1843511231, was published in late 2007 and is recommended by 107 Cowgate. A song about Jack Doyle The Contender, written by Jimmy McCarthy, has been performed by Finbar Wright, Christy Moore (see below) and Tommy Fleming among others. Jack Doyle: The Gorgeous Gael is highly recommended. Christy Moore’s version of The Contender.